2017 has been a wonderful year, with some exciting invitations to design. It’s so nice to be invited to create for a group of stitchers, anticipating and imagining what you might come up with. The challenge, of course, is deciding on just 1 or 2 projects for a specific event or commission, especially with a limitless list of possibilities. Thank goodness for deadlines! I might never surface from “exploring the options” to make firm and fixed decisions without them. I’ve designed 9 new patterns for 4 wonderful stitching events this year, and have really enjoyed collaborating with stores, meeting wonderful people and sharing time and techniques with them. I always learn so much from those I meet and have treasured the opportunity to hear about others’ relationships with needle and thread. I’m currently in the process of adding photos and details of these 9 new designs to my “available patterns” page. Check back over Christmas to see them all. Working with Tilda fabric is always a joy, so I was thrilled to be asked to design for this month’s Tilda Club… my 10th and final design for 2017. 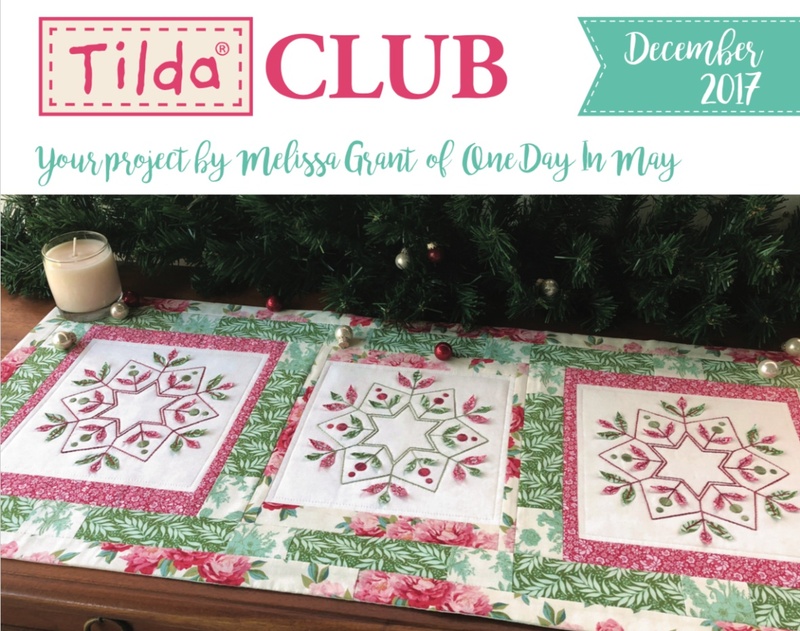 Tilda Club is a bimonthly fabric club, organised by the team at Two Green Zebras and is available to join through patchwork stores. Tilda fabric ranges are beautiful. Bold yet pretty… and filled with botanical prints, my absolute favourite! When designing for December’s club pack, I had Christmas on my mind. 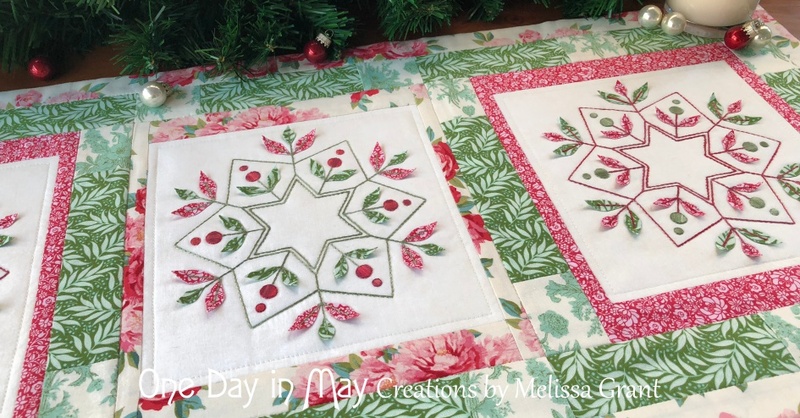 The soft reds and greens in Tilda’s “Cottage” range work beautifully together in a Christmas project. 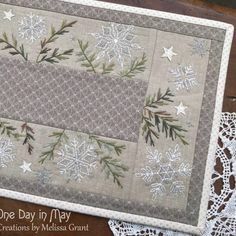 “Merry & Bright” features four “Cottage” fabrics, combined with a simple off-white background fabric, embroidery and dimensional applique. 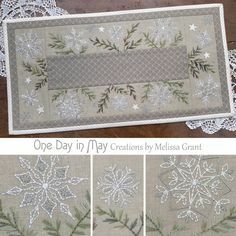 Three panels are embroidered, then embellished with leaf shapes cut from easily made double-sided fabric. 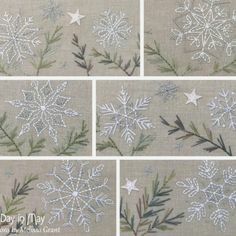 The shapes are only attached to the panels with central embroidery, leaving the edges free to sit up from the background a little. This adds a subtle dimensional quality to the design. Adding dimension this way would have to be one of my favourite techniques. I love that any shape is possible, and the smallest of shapes too. There are no tricky corners or curves to applique down. Just a little embroidery to hold the shapes in place. 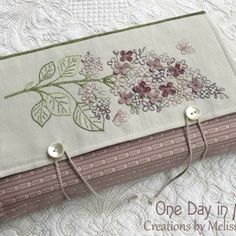 All central panel embroidery and leaf shape attachment is stitched with Cottage Garden Threads ~ stranded Oregano. Both side panels are stitched with Cottage Garden Threads ~ stranded Red Carnation. I’m (not so) secretly addicted to variegated thread. I’ve found it can bring the simplest of embroidery to life. 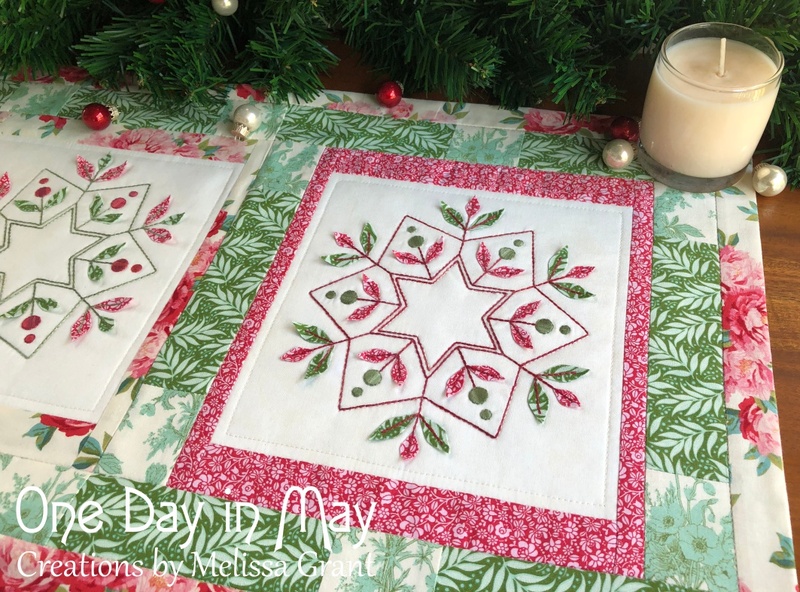 Each panel is trimmed with “red”, and bordered with pieced rows of green. The large print makes a wonderful outer border, with it’s combination of colours found in the other three fabrics, and also draws the eye to the centre panel. “Merry & Bright” was a lovely project to finish 2017 with. I hope Tilda Club members enjoy creating it as much as I did… a little Christmas stitching during the festive season, maybe. Keep an eye out for the Tilda “Cottage” range at your local patchwork store. 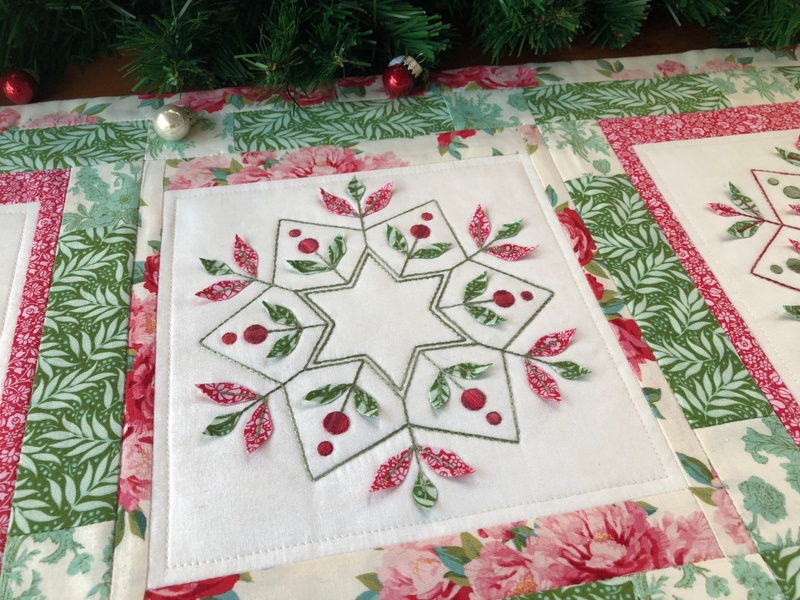 The “Merry & Bright ~ table runner” pattern is exclusive to club members for now, but will be available for general purchase mid 2018. Awesome Melissa, love the bold colours. 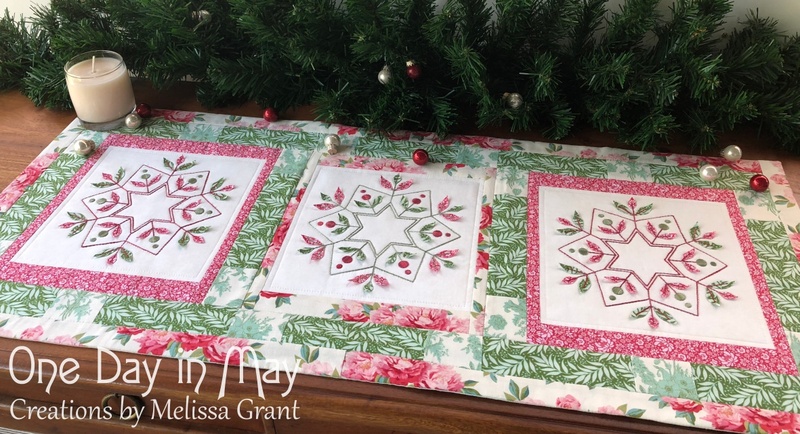 Hi Melissa, Please advise if the Christmas Table Runner which you designed using Christmas Tilda Range (Christmas 2017) is still available in Kit Form. Regards, Eileen Mellor. Beautiful design, colours & thread. Will have to add it to my 2018 list. Gorgeous project. Have a Merry Christmas Melissa.